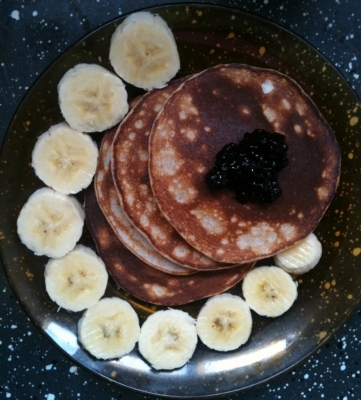 Easy fluffy and yummy protein pancake. Mix dry ingredients. Then mix the egg white and milk, mix thoroughly. Heat a nonstick skillet and pour 3 tablespoon of batter to each pancake, cook for 30 seconds each side. Top with sugar free jam and some slices of banana.